Sergiy had been scheduled to leave the ship for a vacation at the end of this cruise, but is going to have to stay an extra week to break in the new Chief Mate. This week he is also training a new Second Officer. I had thought the Second Officer would move up when the Chief Mate departs, but that's not how it's done. Each member of the crew signs up for a specified position for a specified duration. Some sign on for six or eight months, some for four, others for just a few weeks. No vacations are allowed during the contract. Sergiy has been on board since January. The Captain, First Mate and Chief Engineer are awarded single cabins. The two Second Officers share a cabin. The other 75 crew members are quartered two, three or four to a cabin. We picked up some stowaways in Bastia. Breaking the early morning silence was the chirping of cicadas which are very common in the south of Italy and can be heard in any rural region or small town. At times, in some areas, they can be extremely noisy. They can also fly onto ships and hide, seldom seen but always heard unless the sound of the sea or wind drowns them out. In the net, I couldn't hear them; but I had another visitor: a tiny bird who hopped around me and the net for twenty minutes before flying off. The Star Clipper sailed along the northern shore of Elba and into the harbor of Portoferraio, where she moored at the dock. We strolled along the seafront, wandering in and out of shops, until reaching the Linguella ("little tongue"), a narrow strip of land which provides natural protection for the harbor. At the end of the Linguella is the Torre del Martello, a fortification built in the 16th century to protect the port. The tower is pretty run down and no longer open to the public. Next to the tower are ruins dating from about 50 B.C. to 200 A.D; as well as an outdoor movie theater dating from the 20th century. On good nights, the locals can come down for a movie. Nearby is the Civic Archeological Museum, established in 1981 in a 16th century salt storage warehouse. We walked through the Porta a Mare, the arched entrance to the old town and the Piazza della Repubblica, the main square. Two churches were of interest: the Duomo, in the square, and the Ariconfraternita del SS Sacrament, a few blocks away. After lunch, Al visited the Medicean Fortresses while I headed off to the gardens of Ghiaie. The fortress, begun in 1548, is made up of ramparts placed at different levels ascending from the sea. This is a huge fortification, rising from the west end of the old town and harbor. At the top is Forte Falcone, which provided lookouts a panoramic point for observation and sighting. At one time a series of defensive walls stretched east to Forte Stella and then south to the Linguella, thus encircling and protecting the entire town and harbor. Just below the fortress are the public gardens of Ghiaie, a quiet refuge from the busy port. It was a pleasure to sit on a bench and read quietly, and to watch little children play on swings and slides. The gardens take their name from the nearby Ghiaie beach, a long pebbly strip where many people tried to combat the excessive heat. The new commercial harbor lies west of the old town. 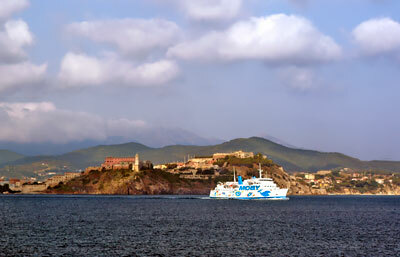 Here are three long piers that accommodate the ferries that regularly arrive from the mainland, Corsica and Sardinia. I watched the Marmorica arrive from Corsica and the first vehicle to disembark was an ambulance which roared off the ship with lights flashing and siren screaming. We found an internet café to check and send emails, and to have a cool drink. Then it was back to the ship. 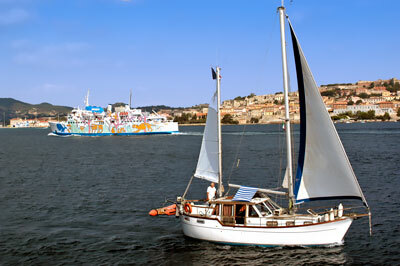 One of the tour groups was running late and had not returned at the scheduled departure time, so the Star Clipper slipped her moorings, sailed out of the harbor, and dropped anchor to wait for the stragglers. About an hour later, the tender brought them from shore and we were on our way.